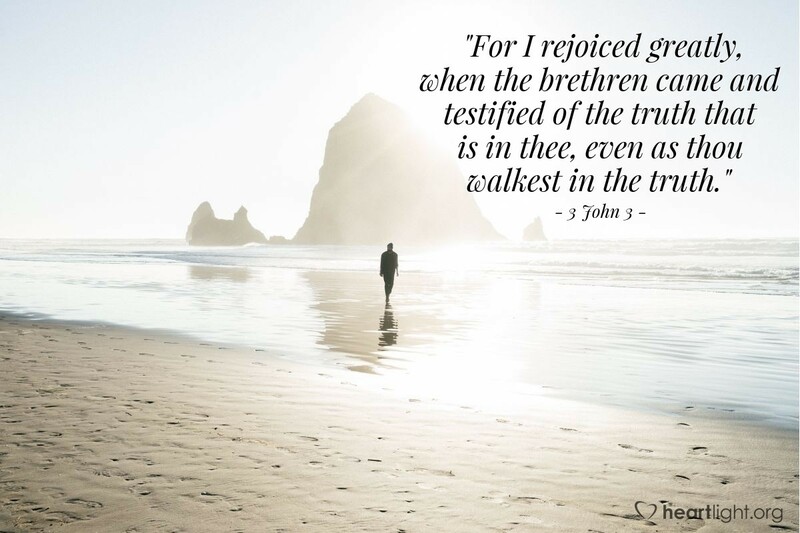 "For I rejoiced greatly, when the brethren came and testified of the truth that is in thee, even as thou walkest in the truth." The truth was in Gaius, and Gaius walked in the truth. If the first had not been the case, the second could never have occurred; and if the second could not be said of him the first would have been a mere pretence. Truth must enter into the soul, penetrate and saturate it, or else it is of no value. Doctrines held as a matter of creed are like bread in the hand, which ministers no nourishment to the frame; but doctrine accepted by the heart, is as food digested, which, by assimilation, sustains and builds up the body. In us truth must be a living force, an active energy, an indwelling reality, a part of the woof and warp of our being. If it be in us, we cannot henceforth part with it. A man may lose his garments or his limbs, but his inward parts are vital, and cannot be torn away without absolute loss of life. A Christian can die, but he cannot deny the truth. Now it is a rule of nature that the inward affects the outward, as light shines from the centre of the lantern through the glass: when, therefore, the truth is kindled within, its brightness soon beams forth in the outward life and conversation. It is said that the food of certain worms colours the cocoons of silk which they spin: and just so the nutriment upon which a man's inward nature lives gives a tinge to every word and deed proceeding from him. To walk in the truth, imports a life of integrity, holiness, faithfulness, and simplicity-the natural product of those principles of truth which the gospel teaches, and which the Spirit of God enables us to receive. We may judge of the secrets of the soul by their manifestation in the man's conversation. Be it ours to-day, O gracious Spirit, to be ruled and governed by thy divine authority, so that nothing false or sinful may reign in our hearts, lest it extend its malignant influence to our daily walk among men.